Editor/Author Sullivan-Marx, Eileen, McGivern, Diane and Fairman, Julie, et.al. 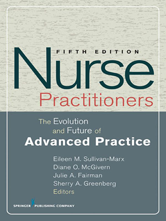 This fifth edition discusses the evolution and future of advance practice nursing, primarily for APN faculty and APN/NP practitioners as well as for leaders and administrators in education. Fully updated and expanded, the book comprehensively describes the historical, social, economic, and global contexts of advanced practice nursing. The team of expert contributors provides a wealth of insight into key issues of the day, such as the mechanics of financial recognition of NPs, the effects of managed care, and the globalization of advanced practice models. The new edition also presents a fresh perspective on the role of nurse practitioners in both small- and large-scale reform initiatives-such as health promotion, disease management, the rapid spread of global disease, and the diminished economic capacity of many countries to meet standards for health care. Enriched with case studies, key principles, and best practices, this book is a must-have for all those invested in the current and future status of advanced practice nursing.